In my February 9 post on US Ambassadors: The Brave New World of Blogging I mentioned our US Ambassador to India, Tim Roemer as one of the three ambassadors without blogs but who still managed to run a pretty savvy media operation in their countries of assignment. 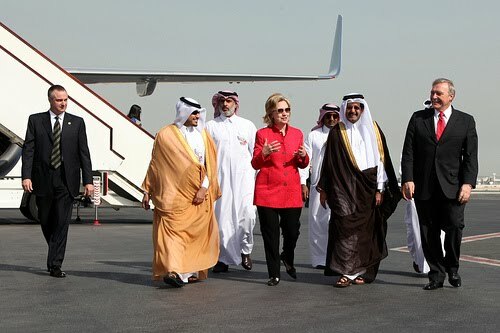 Ambassador Roemer actually started his blog, Roaming Roamer on February 5th with a photo. The next few entries were more like micro-blog entries; longer than Twitter’s 140 characters but shorter than what you would normally expect in a blog. But short or long, Ambassador Roemer has officially joined the blogosphere with Roaming Roemer. If he actually writes what he does and where he goes, I’m sure he’d have a lot of material; except that I can’t imagine where he’d get all the energy to actually write. See his travel map here. See his pretty hectic events here. It looks like he is also pretty busy with mission visitors including White House Chief of Staff Rahm Emanuel, Senator John Kerry, SRAP Richard Holbrooke, FBI’s Robert Mueller, U.S. Energy Secretary Dr. Steven Chu and many others. I reposted a sample of his recent posts below. I’m actually heartened that he wrote about Consular team appreciation last week. You don’t hear that often enough from chiefs of mission. COM sightings in consular sections are also considered quite rare in some places. Today I was asked to participate in a country-wide Digital Video Conference with our consulates and officers working in consular operations on a Leadership Skills Workshop. I expressed my gratitude to them for all of their successful work serving as the “face” to our outreach efforts everyday in India on visas and American Citizen Services. They were concentrating on improving their technical skills and communicating with the “next generation” in this young democracy. I reflected later in the day how fortunate I am to have all the highly motivated and deeply committed staff at our embassy and in all our consulates. We hosted a reception at Roosevelt House for Sulabh International, an organization in Delhi that builds water efficient technology for toilets, improves sanitation and hygiene, and provides opportunities for “untouchables” to get a better education. In the Gandhiji tradition, Dr. Pathak, the founder, is working to remove the legal and social barriers to the caste system for the “scavengers”. These lower caste dalits are told from birth that they must clean toilets and human waste, and have no other choices in life. Sulabh’s guiding philosophy, like America’s, teaches that everyone is equal and gives their employees the tools to pursue other vocations and follow their dreams. This is an amazing story of hope, change, and progress. I’m cooking over a traditional chulha and can feel and taste the smoke stinging in my eyes and throat. 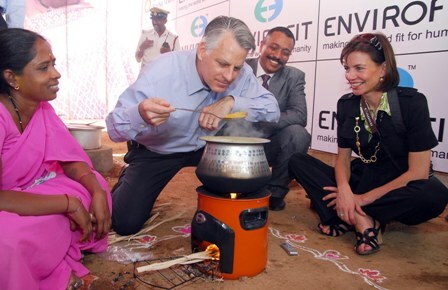 Moving over to the new technology, the Envirofit cookstove, the steam coming off the rice is the only visible emission! There is a huge difference for health and the impact on the person doing the cooking with the green technology. I decided to purchase two cookstoves on the spot! Check out Roaming Roemer here. Also check out the photo gallery here; lots of interesting snaps of the ambo in leis, in different head gears, parasailing, riding a rickshaw, holding a baby, etc. What energy! Of course, other ambassadors may have perfectly comparable hectic events and travels but if we cannot see them online, how are we to know about them? Note that US Mission India is not in the Web 2.0 fold. It is not on Flickr, Twitter, YouTube or Facebook (only the American Center and Library in New Delhi is on Facebook). And yet, it is still able to inform us what the embassy is doing and saying. I don’t know who is actually doing the updating of the embassy’s website, but he/she/they deserve a shout out for being always current, and timely. Keep it up folks! Oops, I stand corrected – US Embassy in India is not on Facebook, Twitter, or Flickr. It has a YouTube channel but there is no visible link from the embassy website to YouTube, so I missed that altogether. US Consulate General Chennai carries the Ambassador’s blog, is on Facebook with 226 fans (thanks Jill!) and has a link to US Embassy Delhi’s YouTube channel (that’s how I found out that Embassy New Delhi is actually on YouTube). US Consulates General in Mumbai, Hyderabad and Kolkata all have visual links to the US Embassy’s Ambassador Roemer in Action page but otherwise have no other official social media presence. Professional Associates Program: When Bureaus Get Confused — Watch Out! The selection process used to fill one vacant Foreign Service officer position was not handled in accordance with written guidance on the Professional Associates Program. Confusion between the Bureau of Human Resources Office of Career Development and Assignments (HR/CDA), WHA/EX, and the mission in applying EFM and veterans preferences contributed to the problem. Because no Foreign Service officers bid on Brasilia’s senior GSO position, HR/CDA added that position to the Civil Service Hard to Fill Bid list (State 00046622) and the Professional Associates Program Hard to Fill Positions list for EFMs (State 00046614) simultaneously. According to the Professional Associates Program cable, “Qualified EFMs will be given preference over equally qualified Civil Service employees. Veterans will be given preference in the selection process.” The cable also states that an HR/CDA panel reviews all EFM and Civil Service employee applications and forwards only those deemed qualified to the regional bureaus and that “Selections are made by the bureaus.” HR/CDA deemed the EFM candidate as qualified, and forwarded his application, along with a number of Civil Service employee applications, to WHA/EX. The mission contended that it appropriately recommended the “best qualified” candidate, and that it was the regional bureau’s responsibility to apply EFM and veteran’s preferences and make the selection. WHA/EX staff interviewed by the OIG team said that selecting the “best qualified” candidate was appropriate, and that if a “fully” or “minimally” qualified EFM or veteran was supposed to have been given absolute preference, HR/CDA should have forwarded only that application to WHA. HR/CDA staff said that the regional bureau and/or the mission is permitted to rank order the qualified candidates and to select the one deemed “best qualified.” HR/CDA said that, unlike the process used to fill a locally employed staff position at the mission, the bureau is not required to select a “minimally” or “fully” qualified EFM or veteran candidate when filling a position normally assigned to a Foreign Service officer. None of what HR/CDA said, however, is included in the Foreign Affairs Manual, in standard operating procedures, or in Professional Associates Program materials provided to EFMs. Also not covered in guidance is whose responsibility it is to consider the cost implications of the hiring decision. Embassy Brasilia, for example, incurred an additional $51,000 a year in residential leasing expenses by hiring the Civil Service employee. HR incurred relocation expenses that it would not otherwise have incurred. This is actually quite hilarious if only it’s not painful to laugh (certainly not hilarious to the qualified EFM with veterans’ preference who was passed over for this job). I mean, c’mon – it’s not like this program had just been rolled out yesterday at noon. So — instead of hiring a qualified EFM who was already at post, the government spent $51K to bring in the “best qualified” candidate to post. I don’t think that sound very “family-friendly,” do you? And if a “recent Department experience” is the bar for “best qualified” candidate, just about every new EFM would be out of the running for these jobs. Holy mother of goat! I just realized that old timers who have not worked for the USG within the last year would also be out of the running for these jobs! In a case like this, one can’t help but think that the EFM hiring preference is well – kind of a stand-up comedy routine that purports to be serious bizness. In must add that whether or not you’re happy with the performance of the OIG, things like this would never see the light of day without such inspections; unless of course, the case ends up in the Foreign Service Grievance Board. Or in court. I’m not even sure EFMs are eligible to grieve under the FSGB. But certainly, veterans’ preference candidates have an avenue for redress spelled out by the Department of Labor. DOL says that Veterans’ Preference Eligibles who allege violations under such individual’s rights under any statute or regulation relating to veterans’ preference may file a complaint with the Secretary of Labor, The Veterans Employment and Training Service Agency (VETS) within 60 days after the date of alleged violation. Complainant may also appeal their case to the Merit Systems Protection Board (MSPB). And if the MSPB has not issued a decision within 120 days, claimants may seek judicial redress in the US District Courts. Details of these procedures are identified in section 3 of the VEOA, PL 105-339. Read more from DOL’s e-law here. Of course, a job applicant with EFM and veterans’ hiring preference passed over like this may still opt not to challenge the decision — in a tide pool with extremely limited job opportunities, that would be like committing a future job suicide. The OIG reports on our US missions overseas often make quite interesting reading. I look at these reports kind of like imperfect report cards for our consulates and embassies overseas; but they’re the only ones the public get to read on mission performance. There are a couple of things that I think might improve these reports – one is to revert to the old practice of including the names of the members of the inspection team in the publicly available reports. Well, maybe they are included in the original reports, but are stripped from the publicly posted version. I can’t think of any good reason why the names of the members of the inspection teams should be redacted from the publicly available copies, can you? It would be nice to know who are inspecting whom. After all, even the OIG should not be exempt from public scrutiny. There are already allegations of its handling of grievances related to HR; that the Department’s Inspector General “seems to regularly turn the complaint back to the office against which the grievance was filed (see Patricia Kushlis’ blog post).” My post last week on Brussels got a come back from somebody who says that the OIG is just out to protect the big house. The last thing you want to happen is for the Inspector General’s Office to be perceived as ineffective or just protecting the DOS. The State Department should also hurry up and fill the slot for its Inspector General. The former Inspector General, “Cookie” Krongard appointed in 2005 resigned from office on January 2008 and has yet to be replaced. Retired FSO and former Ambassador Harold W. Geisel has been the Deputy IG since June 2008. The second item on my wish list is more tricky. The OIG reports often have a section on executive overview or executive direction that talks about front office leadership. Sometimes this section can be a bit muddled talking about excellence or success in policy engagement/objectives but not so much about the nitty-gritty part of leading and managing the mission. Since most missions have the ambassadors handling external affairs and the DCM handling the internal business of the mission, I thought the reports ought to follow the same line of discussion. How effective is Embassy “Z” in fulfilling its mission? What is the quality of its mission leadership? Technically, a mission can still achieve its foreign policy objectives even if its people are overworked, have low morale and are counting the days when they leave post and survive their bosses. They are professionals after all; they have to do their jobs. The question is — when policy objectives are achieved, how much does it matter or who really cares if the parts did not work as well as they could have? There are senior bureaucrats who value individual brilliance on policy making/achievement of policy objectives over leadership and management. I admire individual brilliance, myself, but what good is that if all the folks working for you are miserable? I almost wish the OIG has a scorecard similar to a grade point chart where all the parts of the mission get a rating from F to A+; and where the front office gets a split rating for achieving its policy objectives and for the quality of its leadership and management of the mission. Achievement of foreign policy goals deal with the immediate need of here and now, and that is important and necessary. But the work of strengthening the institution is the work of generations and no less important. Continuing to ignore the latter will have repercussions for decades to come. The Most Expensive Embassy in the World? US Consulate General Curaçao: New Vice Consul?